The benefits of shared out-of-office experiences are well-documented. Numerous studies by leading universities and other credible research sources have concluded that the way people work together is an important ingredient in a project’s (or company’s) overall success. Once you have fun with someone, it’s a lot less tempting to undermine them. 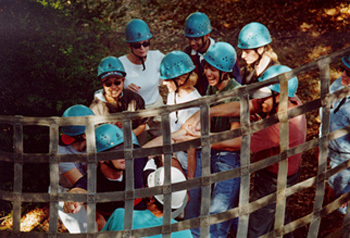 Team building exercises are important not for the immediate experience of the activities performed by the team, but also for the group skills, communication and bonding that result. It doesn’t seem to make much difference what a group does together—be it the ropes courses, wine tasting, scavenger hunts or cooking classes or something else entirely—as long as there’s a positive attitude (or at least open minds) going in . . . 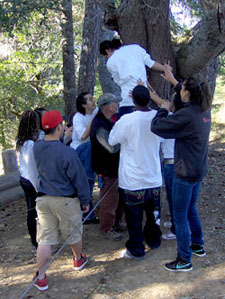 Housed on 15 acres at Ocean Song, a privately owned, 340-acre environmental education center located in the coastal hills west of Occidental, Four Winds Teambuilding and Leadership Training facilitates between 200 and 300 programs every year. In addition to corporate clients, the company welcomes students (fifth grade through graduate school), professional organizations, law enforcement agencies, government employees, at-risk youth groups and sports teams. Among those skills, he continues, are consensus building and conflict resolution. Divided into groups of about 10, each with a dedicated facilitator to oversee and moderate the day’s activities, participants are then presented with a series of “simple and elegant challenges.” And while the course is outdoors (with sweeping views of Pt. Reyes and the Farallon Islands) and many ropes, nets, ladders and pulleys are involved, the solutions are actually more about critical thinking and teamwork than physical prowess. “We’re most interested in getting the group involved in a process of gathering information, making decisions and trying things until solutions are reached. It’s all about paying attention and noticing the details,” says Springer. “From kindergarten through college, we’ve had about 4,607 tests, quizzes and exams, and the one constant has been that there’s been a right and a wrong answer—and we stop when we find the right answer. Here, there are multiple right answers, so you have to decide which is the best answer for your team. Twenty years later, I still have a ball out here, because every once in a while, I see a new solution. “We’re all about ‘Challenge by Choice,’” he continues. “We ask, ‘How many people, by a show of hands, agreed to climb trees when they signed on with XYZ company?’ No one. 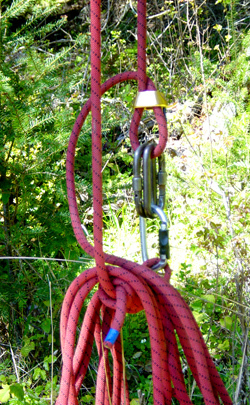 So it’s fine if you don’t want to climb…but will you hold the rope that lets other people climb? Now they’re still contributing and participating —they’re actively engaged in the ultimate success of their team—but at their own level of comfort.” A challenge along the course. Throughout the day, Springer says, coworkers interact with each other in a creative, problem-solving and challenging environment. And as a result, even people who’ve worked together for 10 years end up discovering all kinds of new things about each other. What group of professionals knows more about—probably thinks more about—the importance of teamwork than any other? Athletes and coaches. Tom Mitchell is a former Santa Rosa Junior College basketball coach who, among other pursuits, is also team psychologist for the Golden State Warriors. Over the years, he’s worked with the team’s management, players and a succession of coaches to enhance cohesion. Mitchell is also a business coach, who’s worked with many high-level executives and teams to improve performance. About six years ago, Warriors General Manager (and former star player) Chris Mullin introduced Mitchell to Joe Montana, who after retiring from football, had become an in-demand motivational speaker. 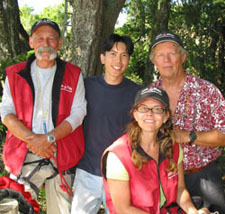 In 2004, Mitchell and Montana teamed with marketing and publishing executive Hilleary Hoskinson (whom Mitchell had coached when Hoskinson was part of Excite.com) to form the MVP Performance Institute. Based in the North Bay, MVP conducts full- and half-day onsite workshops and hosts offsite performance camps at select venues in the region (Vintner’s Inn, Meadowood and Madrona Manor have all hosted). “One of the first questions we ask our clients is, ‘How important is teamwork?’” says Mitchell. “In most cases, there’s an agreement that strong teamwork is essential. But when asked how much time they invest in team building, most companies admit they don’t spend much at all. If businesses could approach team building with the same dedication as professional athletes, even without the 24/7 time commitment, just think about what could be accomplished. A 2005 Wall Street Journal article cites research by Santa Clara University assistant professor Shawn Berman, who analyzed 14 years of NBA results and found that teams that had played together longer won more games—and that the statistics held even for less successful teams that had been together for a long time, which won more often than they statistically should have. MVP is frequently called in to facilitate situations where multiple groups (say, a development company, architectural firm and construction company) have to work together to complete a project. And while a motivational speech from the man many consider the best quarterback ever to play the game can certainly get the adrenaline pumping, it usually takes more than that to instill long-lasting change. “When three or four companies have to learn to work together and improve communication, we start to focus on executive coaching and enhancing performance. 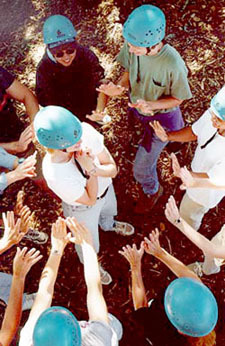 The ropes course is a great place for us to take teamwork to another level,” says Mitchell, who estimates he’s sent more than 50 groups to Four Winds in the last 15 years. It’s all part of finding “the heart of the team” and then building it into a positive company characteristic. “There’s no such thing as a team or a community of people that doesn’t know each others’ stories. So if it’s in the telling of our stories that we connect ourselves, then stories are valuable in a corporate environment or in any kind of organization. It’s our job to create a safe environment where people can—maybe even playfully and with some enthusiasm—come and tell their stories.